When in the file manager in the Windows guest, if I select and right click to copy a file, when I go to try and paste the file, the paste options are greyed out. Similarly Ctrl-C --> Ctrl-V also doesn't work. VBox.log (59.4 KB) - added by r666 9 years ago. I can confirm this bug, paste grayed out... http://imgur.com/dVkHN.jpg Ubuntu 9.04 host, XP SP3 guest, virtualbox 3.0 with 3.0 guest additions for windows. Ok found a temporary workaround, disable the shared clipboard setting, bidirectional needs to be fixed. Same problem here. I could copy via Command Prompt, but the permission of the file is set to readonly. (as the bug about saving with MS-Office suite). I'm having this problem too. When you install Guest Additions, if shared clipboard is active on bi-directional mode, the paste button or shortcut is disabled; but whether you kill the process "Vboxtray.exe" the paste turns on. #4414 has been marked as a duplicate of this ticket. My Original ticket #4414 has my information. Sorry to do this but installed 3.0.2 and GA 3.0.2. Copy & Paste still does not work. Drag and Drop still does. Now it caused Explorer to crash and close the VBox GUI and reopen the VBox GUI. Explorer did not return and caused the Vista screen to reload all objects. Still closing the guest that has the GA's loaded returns the copy & paste function. I found that removing the GA then installing the new GA may have actually fixed this problem. Must be some artifact that does not get overwritten on upgrading the install of the GA. Anyway this seems to resolve the issue. You may close this ticket once again. Thank you VBox team! Confirm this bug in VB 3.0.2 & GA 3.0.2. Copy -> Past work *only* if VBoxTray shutdown or GA is not installed. Unfortunately I was unable to reproduce this using VirtualBox 3.0.3 (our internal development version, but only slightly modified over 3.0.2) and the Guest Additions from 3.0.2. I will try again with the released version of 3.0.2 just to be sure of course. 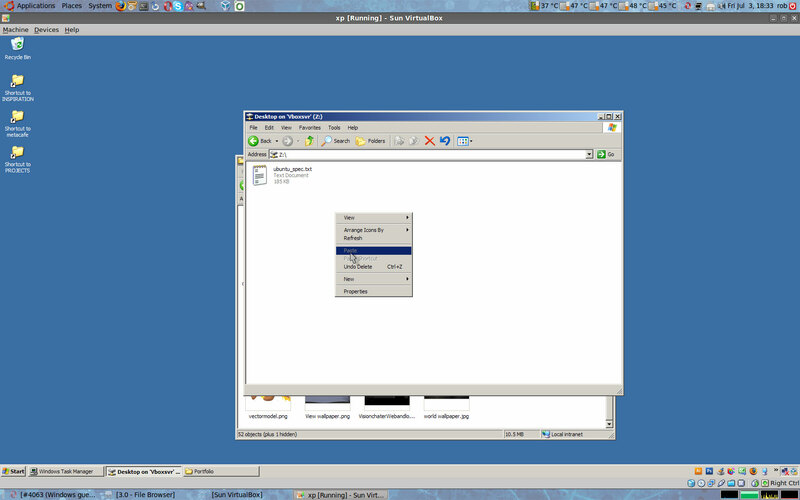 Host OS: Ubuntu 9.04, guest Windows XP Pro SP3, both fully updated; VBoxTray running. siegerstein: would you be able to try experimenting a bit (possibly with a fresh Windows guest if that is doable) to see if you can isolate this any further, to help me reproduce it? Thanks. Update: neither do I see this with a release version of VirtualBox 3.0.2 (Ubuntu 9.04 64bit package) and the 3.0.2 Additions. I have investigated this problem, and found that is was clipboard conflict. In my case it was conflict with VB & Parcellite. After shutdown (also help restart) this clipboard manager, copy -> past work grate! Using glipper and VB have no problem. Seems same minor conflict with clipboard buffer. Thanks for the feedback, I will close the ticket again. I may still take a look at Parcellite though, just to be sure it is not something we are doing wrong. Ctrl-C, Ctrl-V doesn't work, paste options are greyed out! I'm sorry. My mistake, please close.